As we all know by now, the NLL and PLPA have reached an agreement on a new CBA. A number of parts of the agreement have been released by the league, but not all. The document itself is not available to the public (I asked), but I managed to get my hands on a copy. Here are some of the parts of the document that were not included in the NLL’s press release. Rosters are cut from 23 to 20 players. Teams will dress 18 players instead of 20 per game. In addition, pizzas ordered for the team will contain no more than three toppings, or two toppings plus extra cheese. The equipment manager will go and pick up the pizzas to avoid delivery charges. The requirement for each team to have at least five players from their home state or province has been dropped, at the request of the Minnesota Swarm and Colorado Mammoth. League expansion will be considered, but prospective owners are warned that the league will not consider expanding to a city that has more than six or seven previous failed NLL teams. Conference finals and Champions Cup finals will be decided by a two-game series with a 10-minute “mini-game” if the games are split. Wait, that’s not a joke, that’s actually in there. Ontario-based players who want to finish their career with the Toronto Rock must fill out a form available from the Commissioner explaining in 500 words or less why they would be a good fit for the Rock. They must then apply in person at the TRAC where they will meet with both Jamie Dawick and Terry Sanderson for interviews. Wristband policy is in effect. GMs who make trades that include nothing but draft picks where all of the picks are third round or later will be assessed a two-minute Waste of Freaking Time penalty. Players over 30 (down from 32) with enough NLL experience can opt for free-agency. Except if a team designates them a Franchise Player, in which case they can’t. Except if they are over 34 and reject the Franchise Player designation, in which case they can. Except if the team designates them a Special Franchise Player, in which case they can’t. The next CBA will contain the ability for the player to reject the Special Franchise Player designation. Last week, Down Goes Brown did a post (actually on Grantland.com) called The 10 Greatest One-Team NHL Players. Since DGB is unlikely to cover lacrosse anytime soon, I decided to do it myself. Given that there are fewer teams in the NLL, the history is much shorter, and there has been far more team movement than the NHL, there really aren’t all that many such players. If we restrict ourselves to players with more than 50 games in their NLL careers, all with a single team, we find that there are only 54 of them. But there are still some pretty good names on this list. Incidentally, DGB is one of the funniest sports blogs anywhere. If you’re a hockey fan, I strongly recommend it. So without further ado, here are the top 10 players who spent their entire NLL careers with one team. The number of games listed includes playoff games. I’m restricting the number of games played to 100 or more, since it’s not quite fair to put people like Cody Jamieson (54 games) or Garrett Billings (72 games) on this list so early in their careers. 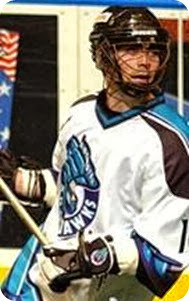 Hollenbeck played ten seasons with the Knighthawks, winning a Championship in 1997. In 2011, he was inducted into the Rochester Knighthawks Hall of Fame. 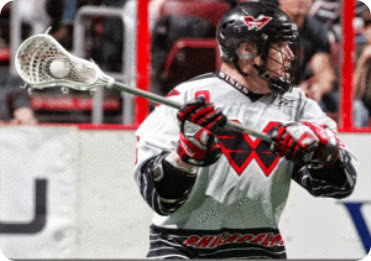 In the early 2000’s, Laddy was one of the anchors of the best defense in the NLL, along with guys like Jim Veltman, Glenn Clark, Terry Bullen, and Pat Coyle. He even scored a goal or two here and there (I distinctly remember a breakaway where he ran up the floor frantically looking around for someone to pass to, then buried it himself), including one in the 2002 Championship game. At about 6’6″ he was an imposing figure and a good fighter too (see above, having a chat with Shawn Evans), though I did once see him dropped with one punch. In a 2002 fight in Toronto, Matt Green hit him with a shot to the jaw that knocked him unconscious. I have heard rumours that the Rock were not allowed to trade Ladouceur because of his job as a Durham Regional police officer (I believe he’s on the SWAT team), but I confirmed with Laddy himself that it’s not true. He said they could have traded him at any time but they were a classy organization and worked with him. 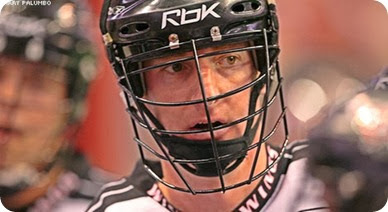 As good a face-off guy as Geoff Snider is, he’s only matched Peter Jacobs’ high of 318 face-off wins in a season once. (The all-time record is 319 by Bob Snider in 2012.) Jacobs is also the only person not named Snider to ever have a face-off percentage above 70% for a season. Jacobs played 12 seasons for the Wings, winning just shy of 60% of almost 3,000 face-offs. He didn’t finish a single one of those seasons with a percentage below 50%. Bergey played ten seasons in Philly and won two Championships. He scored 50+ points six times, including 86 in 14 games in 2001. He’s currently second all-time in Wings goals, assists, and points. In the 2007 expansion draft, he was chosen by the Boston Blazers, but was traded back to Philly before the season started. Then the Blazers sat out the 2008 season so there was another expansion draft. Bergey was chosen by Boston again, and again was traded back to the Wings. He has to be one of the few players who played for a single team his entire career and yet was traded twice. McBride has played 11 seasons in Calgary, and has been the captain since Tracey Kelusky was traded after the 2010 season. He’s a defender, transition player, a fighter, an outstanding team leader, and you’ll never hear a more well-spoken guy during an interview. And when is Movember time of year, he is look like Borat. 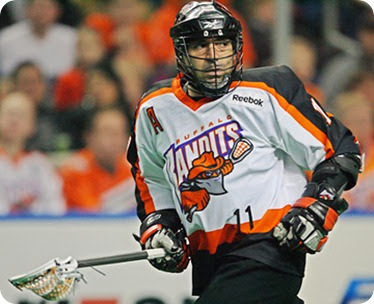 Darris’ big brother was captain of the Bandits for 12 years, won four championships, had his number retired by the Bandits and is in the NLL Hall of Fame. 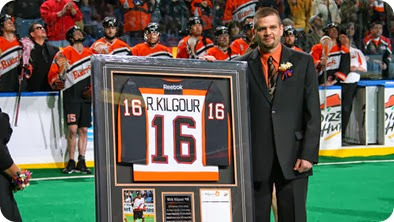 Only one player personifies the Bandits better than Richie Kilgour and, well, we’ll get to him later. 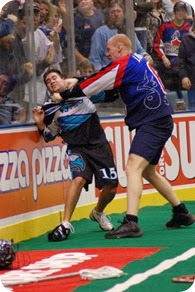 Regy Thorpe was a big tough defender who played an amazing fifteen seasons with the Knighthawks, beginning in 1995, the team’s first season in the league. He won two Championships and was captain of the 2007 Championship team. But most interestingly, he was the first player-GM in NLL history when he took the reins of the team and played in the 2009 season. 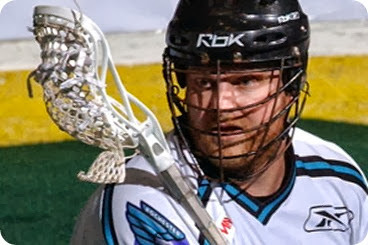 His tenure as a GM only lasted one season before owner Curt Styres took over, but much to the chagrin of NLL scorers, Thorpe played one more season before retiring in 2010. 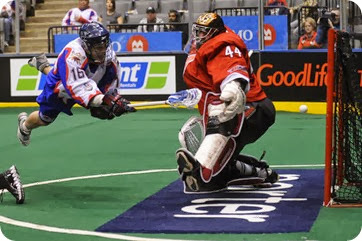 Blaine Manning had a pretty successful start to his NLL career, winning championships in 3 of his first 4 seasons (2002, 2003, 2005) with the Toronto Rock. It kind of went downhill after that for a couple of years, but after The Rock GM Who Must Not Be Named was fired and Terry Sanderson was brought back, Manning was a big part of the rebuilding process that resulted in the 2011 NLL Championship. Long before Dan Dawson arrived in Boston, Manning was one of the original Big Three along with Colin Doyle and Josh Sanderson in Toronto. They peaked in 2005 when Doyle finished first overall in scoring, Manning tied with John Grant for second, and Sanderson tied with John Tavares for third – and all five of them finished with over 100 points. I went on and on about Manning in an article right after he retired, so I won’t rehash all his stats here. Suffice it to say that Manning should be a lock for the NLL Hall of Fame once he is eligible. 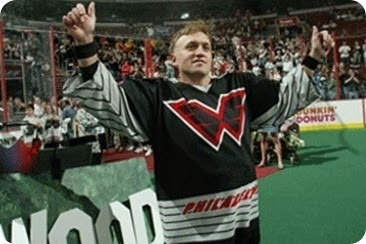 Tom “Hollywood” Marechek won four championships in 12 NLL seasons and was inducted into the NLL Hall of Fame in 2007. Marechek is the all-time Wings leader in both goals and assists, and is 8th all-time in the league in goals. But of the top goal-scorers in league history, only one player in the top 10 (and two in the top 25) have played fewer games than Marechek. The only players who averaged more goals per game than Marechek are Gary Gait, Paul Gait, John Grant, and John Tavares. Not bad company. 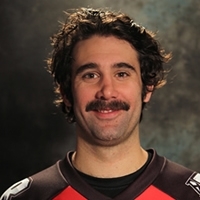 Hard to believe he’s only the third-best lacrosse player from Victoria, BC. No-brainer. Tavares is one of the best players ever to play in the NLL (many argue he is the best), and after 22 seasons with the Buffalo Bandits, there’s no argument who’s at the top of this list. Or most lists, for that matter. Since Tavares is still active, the amazing numbers will just continue to climb. These guys didn’t quite make the 100 game limit, but I wanted to acknowledge them anyway. News flash: Lacrosse is different from other pro sports. Why? Lots of reasons. It’s the handshakes after every game, not just after a playoff series. It’s the post-game parties, where players hang out with fans. It’s the goalie sitting in the penalty box after a major penalty. But one of the most-often mentioned differences is that lacrosse players aren’t paid nearly as much as NHL, NBA, NFL, or MLB players. One quick example: if longtime Bandit John Tavares had made the current league maximum salary for a franchise player (about $34,000) for each of his 22 seasons, that would come to a little less than $750,000 over his entire career. Since the max salary hasn’t been that high the entire time, and Tavares hasn’t made the maximum every year, his actual career total would be much less. His nephew John Tavares, the captain of the New York Islanders, made $900,000 last year alone. And a number of hockey players make ten times that. Alex Rodriguez makes almost thirty times that. The salary thing is brought up a lot, as proof that lacrosse players play for the love of the game and not for the money. I’m not going to argue with that statement (at least not right now, though I have before), but there is an important corollary that often goes unnoticed. With all the talk in Toronto this past week about Phil Kessel signing an eight-year $64-million extension with the Maple Leafs, it hit me. Lacrosse fans don’t care about player’s salaries. Lacrosse fans compare players like fans of every other sport. This guy has more goals / loose balls / saves than that guy. This guy has more Championships than that guy. This guy gets more playing time than that guy. There are lots of metrics that people use for comparing players, some more useful than others. But salary is never one of them. When Kessel signed his deal, there were a lot of people talking about whether he was worth it. Who else in the league is making an average of $8 million a year, and how does Kessel compare with them? Did the Leafs overpay? These are questions never asked about lacrosse players. Obviously, it’s because the salaries are so low. But because the salaries are so low, the range of salaries is also low. The league minimum salary for rookies is a little over $9,000, while the highest-paid player in the league makes less than 4 times that (the aforementioned $34,000). By contrast, the minimum NHL salary in 2013 is $525,000 while the highest-paid player, Shea Weber, makes $14 million, or over 26 times the minimum. 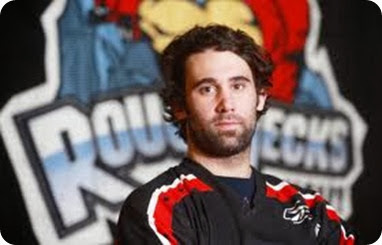 Weber could use one year of his salary and cover the entire NLL player payroll several times. It’s not that salary is never an issue. Just ask the Minnesota Swarm, who traded away Ryan Benesch this past summer and Aaron Wilson and Ryan Cousins a couple of years ago, in deals that very likely reduced their payroll significantly. Were these salary dumps? Maybe, but since we don’t have any details on what players make, we don’t really know. Fans generally know that NLL owners don’t make bucketloads of money from their NLL investment, and so if they have to trim back payroll, that’s just how it is. The NLL doesn’t generally release salary information, but I’m sure that’s partially because fans aren’t asking for it. It’s interesting to talk about a player’s salary when he makes more in one year than you would in a century. It’s interesting when you figure out that Alex Rodriguez makes $40,000 per at-bat, and that’s if he’s healthy and plays a full season; if he only has 300 at-bats instead of 600, he makes $80,000 per. But if a player makes less than you do, it’s not quite as interesting a conversation. Who’s going to do the math and figure out how much Shawn Evans makes for every minute he’s on the floor? (Answer: No idea, since I don’t know Evans’ salary.) If you hear that one player makes $18,000 while another player who isn’t as good makes $21,000, who’s going to be outraged over the perceived injustice? It’s just not enough of a difference to get anyone angry, except perhaps the player himself. But of course the player wouldn’t get angry, since he’s playing for the love of the game and not the money. Right?